There is so much to say that I will most likely write about my own sessions and what I have learned from them in a separate space. This past weekend I had the opportunity to be a part of something that wasn’t only a great day of inspiring learning, but an important step forward in creating a better experiences for kids across an entire region. This story doesn’t start with my cross country flight on Friday morning, it instead starts on the train ride to the airport in Toronto. It was there while I sat talking to Katherine Goyette (my fellow Google Innovator in our Toronto cohort). She was telling me all about her ideas and this new big event she was planning. She was incredibly excited to be bringing George Couros into California’s Central Valley to keynote a conference she was creating. She talked about the strands she wanted to build and the more we talked on that 15 minute ride to the airport, the more it seemed like my coming to TechRodeo was going to be a possibility. My Global Audience Project work was a perfect fit for her “Connected Classrooms” thread. Two weeks later we were talking over social media and she said that in meetings with people, she had told them Google Innovators from as far as New Jersey would be at the inaugural Tech Rodeo. We had to make sure it happened. So less than four months later I was on a 630am flight to Fresno. I was excited for a few reasons. This was my first time in California (I will talk about this a soon), I was going to get to see friends from my #TOR16 innovator group, meet George Couros, and give my first ignite session for a group of over 150 people. On Friday I arrived early enough to travel to some classrooms. I love seeing what other schools look like, what their kids are doing, and how I can incorporate things into my own work. On our way to the district we drove through the towns, the orange orchards, and across the valley. I saw a big disparity between towns, I saw poverty, and I saw some inspiring things. Visiting the Cutler/Orosi School District was a great experience. Our schools on the east coast don’t have open campuses. That was the first major difference. One of the things I was incredibly impressed with was the ability of the school districts to provide fairly seamless wifi to their campus. Students at the schools in Orosi were able to take their chrome books and work outside the classroom. They truly were taking the walls out of play. Another inspiring thing I saw was the recent alumni coming back and giving back. We went into an AVID classroom, but instead of seeing exciting teaching and learning activities, I saw two first year college students that had come back to talk about their experiences with current students. In an area where the culture of college attendance seemed to be a developing phenomena, these students giving back established for their classmates that college is within their grasp. They may not have realized their impact, nor may the students asking questions, but seeing real people who knew 6 months before sharing their experiences brings a level reality to the college experience that can only make those students better. Finally, I saw some incredibly creative classroom designs. Classes designed to inspire collaboration, foster learning opportunities, and maximize resources for their students were in several classrooms and epitomized by Ed Campos’s High School Math class. On the day of the event there were many great sessions. I choose to support my Google Innovator friends, Jennifer Shafer and Crystal Miller by attending their sessions. During our three days in Toronto I learned how incredible these people were, but it was amazing to get their perspectives during their sessions. Jennifer shared her incredible knowledge of Google tools. I wasn’t expecting to learn nearly as much as I did. I found her session remarkably informative and I learned a bunch of new tools I want to implement. Crystal’s session was more inspirational. She inspired me to focus on the value my PD was adding to my teachers. The rest of the day was consumed by my own sessions, which I will evaluate in another post. In the end I spent only two days in Central Valley. These days included an opportunity for me to meet up with old friends and new. I enjoyed wonderful hospitality, the fantastic classroom environments, and an incredible day of learning. I hope to be able to return to Tech Rodeo in the future as the event was fantastic. If you want to read more about the weekend, here are posts about George Couros and my sessions. George is the author of Innovator’s Mindset and I had the fortune of seeing him deliver the keynote address at Tech Rodeo in Tulare, California. While I genuinely value George’s message, it is one that I have been trying to live for several years. He has done a great job of putting it to words, and if you are interested, go ahead and read them, or go see him speak. It isn’t his message that I learned most from during this most recent trip, it was his art. I have always considered teaching an art. That art is often informed by science and math and improved upon by learning to communicate and read others. It is why we fail often, why we continue to strive to overcome those failures. The art is what makes teaching an imperfect quest. The heart of that art, is building relationships with your students. I was one of those students in the crowd for George’s talk(I am going to call him George despite not knowing him much better than most other educational acquaintances for reasons I will allude to later.) Nearly 200 of them. The concept of a class of a few hundred terrifies most teachers because, let’s be honest, building relationships with several hundred people is hard. So how does one do that in an hour? As an educator that is trying to have more opportunities to see and impact education on a broader scale, I was particularly interested in this keynote. I wanted to observe it in the analytical way in which I tend to observe most things; not as a passive consumer of the message, but as a critical evaluator of the how and why. In part, I was curious because later in the day I would have the chance to speak in front of about 150 people (for a much shorter time) and I wanted to learn more about how to do it well. Whether this talk was excellent or awful, I would certainly learn from it. After an hour I can only call what George created as an artistic masterpiece. His keynote captivated and inspired the audience, his message was received, and the day was off to an excellent start. By observing this talk, and without giving away too many details out of respect for the artist, I want to share what I have learned about speaking from his talk and others along the way. Be a People(As Doug Robertson would say): George is larger than life. Literally, he was about 6-8 inches taller than me. He has done many things in his career and has experienced great success. He exudes that confidence when he stands in front of a crowd. He could easily stand and produce an hour of engaging stories about success, but not every story was about his success. The beauty of this art was that it was also about struggle. Struggle is what most educators can relate to on an everyday basis. In the ever expanding net of social media (which I will henceforth refer to as media- via Crystal Miller) education tends to be the “Everything is Awesome” space. Everyone everywhere shares their awesome. They should, it is important to help people find what works and how to replicate it. It is also important to tell the stories of your school and your students being successful. Conversely, it can be overwhelming to think that so much awesome exists in the world. The awesomeness can overwhelm people and they forget you are a real person that struggles, that failed before you succeeded, and that needed the support of others along the way. George’s talk managed to meet those points while stressing his message, and reminding us that the awesome things only happen when we persevere. Keep the Balance: As a speaker and as an educator, you have to know when to let the crowd dangle over the cliff and when to pull them back up again. Finding the right combination of heart-warming examples, grief-inducing struggles, and balancing it out with humor (especially humor that reminds people of you “being a people”) is the best way to build off of the personal connections you made during the beginning. If you take your audience to the edge and then throw them off, there is no coming back from that. You instead need to show them the ground, tie the bungee cord to their feet and jump along with them. The fall may be a little hard on some, but it is important that you help them bounce back. Keeping a large group engaged involves a good story. Be a Storyteller: So this is another I learned well from Rafranz (this is really the first keynote I have seen since getting to meet her.) My message is incredibly important to me. It should be important to you, but it isn’t. Why isn’t it important? Simple, I don’t care enough about the characters. As an author, I learned a valuable lesson learning about story telling. If I don’t care about the character in the first 15 minutes of a movie (first 5-10 pages of a book) I don’t want to keep going. In writing you typically have your main character lose someone/thing important, or save someone/thing important. George talked about his dad, about his journey, and about losing him. All that was incredibly personal, but it was also a great story. The stories about others that were told through his voice were equally great stories. Anyone can be a storyteller. Talk to the audience as if they are your old friends. From both George and from Rafranz as well, when they told stories, I felt as though they trusted me with a bit of themselves. Complete the Loop: I am reminded of a famous quote by T.S. Elliot, “We shall not cease from exploration, and the end of all our exploring will be to arrive where we started and know the place for the first time.” The story starts and ends with a message, as well as George’s family. The message: take risks, be willing to try, and always keep learning. In the end, we understand this message through the eyes of George’s mother. The circle completed, our journey brings us back to the beginning, only this time, the audience as a stronger understanding of what has been said. The Challenge So this wasn’t explicitly a part of George’s talk, though I wish it would have been(it was still implied.) In Crystal Miller’s session later that day she said something that stuck with me (I will paraphrase) “If we give professional development and it’s not making an impact in classrooms, take it personally and make it better.” I left my Ignite at the end of the day with a question, “What will you do to open up a larger world of possibility for your students?” We have to leave our audience inspired to act. If they don’t take that message and use it to make a change, what good was all of the rest of it? The talk George gave was a work of art. I continue to refer to him as George not because of a particularly funny moment in the keynote, but because in that short time, he was able to make a connection. Through his stories, I feel as though I know him. His message permeates through the structure and story of the whole thing, and in the end, it was heard by so many because of the connection between the person and the abstract idea we were supposed to take away. I hope to become a speaker of that quality. Even in writing this I have learned more, especially in seeing how all of the things I learned from Rafranz Davis about telling my own story were expertly woven into a message to inspire people. There isn’t a formula for art that will make it beautiful, powerful, or moving. There are, however, a number of useful techniques that, when perfected, come together to bring a gravity to the whole. This is what I hope to achieve personally, and what I was treated to during this talk. Three days is not enough to teach coding, nor is an hour. So when I tried to figure out how to squeeze coding into three class periods for all of the students I teach, I wasn’t sure how to make it work. I wanted them to understand what coding was and how it worked. Just as importantly, I wanted them to understand what was possible. So many things in the world are made with code and so many more will be made with code in their lifetimes. To introduce them to the possibilities, we worked with Ozobots. Our school had purchased 30 of them last year to start incorporating more robotics and coding into the curriculum. This was the first opportunity for many of the students to take control of a tiny robot on their own. 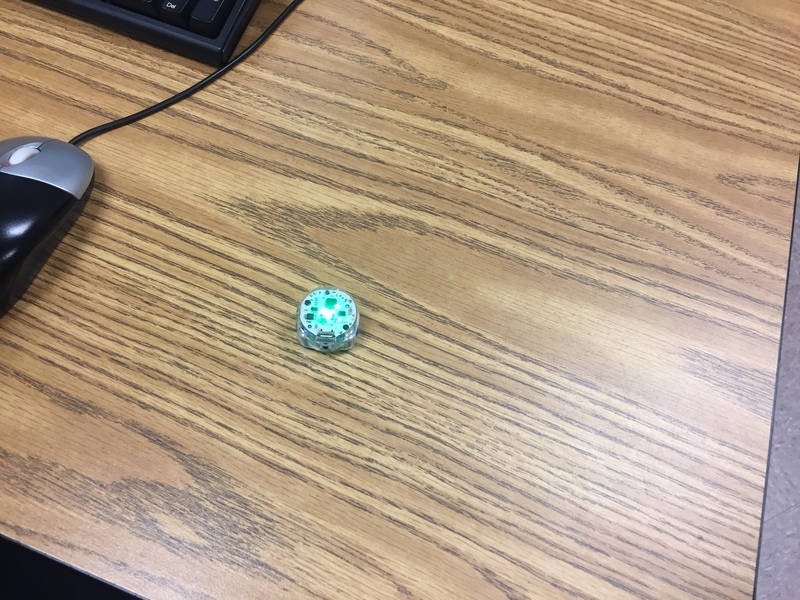 The first, and possibly most challenging step for the classes was understanding how to tell the Ozobot that you wanted to upload code from the computer. Ozobots work by reading colored lines on paper. They also work by interpreting a series of flashing colors that their Blockly coding program translates for the Ozobot. 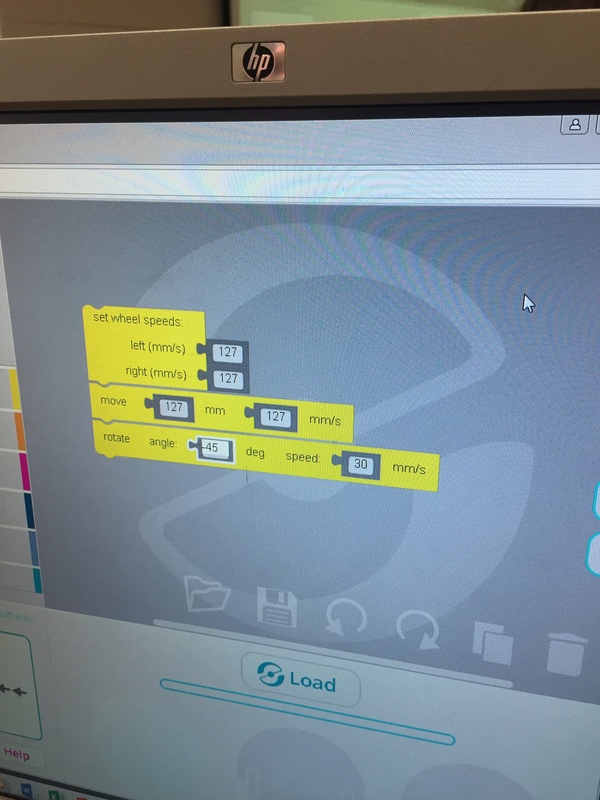 This allowed the students to work in a format they were more comfortable using while still taking control of the robot through code. It took many of them several minutes to get the process down. I explained it by saying it was exactly like our unplugged activity. If you are not deliberate and exact in the way you prepare your Ozobot for acquiring your code, it will not know you are giving it code. These tiny robots captured the imaginations of my students. At the end of three days of coding, I spent a moment reflecting with my classes. Why did we do this? By the time many of them hit the legal driving age, self-driving cars will start to be more prevalent, labor jobs will be even more automated, and everything from your refrigerator to your light bulbs are going to be running on code. The possibilities are endless. Silly video games and tiny robots are not the end, they are the beginning. Where they choose to take it is only limited by the possibilities they can imagine. In 2015 I sought to empower others. I felt good about it, but in reality I always want to do that. I always want to do more in that area. In 2016 my goal was to create. After some great experiences, projects, and the creation of The Global Audience Project I would say it was at least a partial success. I know I need to finish more. I need to complete more this year and while “finish” would have been an interesting choice for my word this year, it includes a finality that I am never comfortable with using. All of the things I work on are constantly in a state of improvement. I thought about skipping this year for a single word. It was difficult to imagine how it would be sufficient to describe the many goals I have for myself. Reflecting on this past year has reminded me of something, my voice has been missing. I have spent this year in the background of many discussions. After three years as an active social media user, blogger, and public educator, I realized how little I had shared this year through my public presence. If I was not at an event or publicizing something I had created, my public presence has diminished. That may be a natural thing for many educators. My use of twitter and other social media has been about developing connections. I feel strongly about the success of that in the past year, but I also remember how I created those connections in the first place. I am indebted to the many amazing people with whom I have connected over the past three years, but what I haven’t done enough in the past year, is find new people. I have found some great people in 2016. Some of them have made my life immeasurably better, but the pool to choose from has become much smaller. Ultimately, what I regret most is that I have not injected my voice. I have shared many ideas in small groups, in quiet discussions. I used to share that voice regularly, and it connected me with amazing people. This year I will find a way to rediscover my voice. I plan to recommit to blogging on a more regular basis, sharing my ideas and asking more questions in public social media, and ultimately reminding myself of what I value and offer as an educator. This will most likely mean I bore some people. It may also mean I offend others. This year I don’t plan on sugar coating my public persona, but I also don’t plan on hiding it as much either. My voice is one that asks a lot of questions, one that thinks logically and analytically, and offers pushback on the all too frequent bumper sticker statements that clutter social media. It may not always be what you want to hear, but it will be honest, it will be well thought out, and it will be heard.